SPCR • View topic - Turn off discrete graphics? Post subject: Turn off discrete graphics? I'm new to your excellent site and have both a general and a specific question. They may of course be based on faulty premises. Can you turn a discrete graphics card off (using the BIOS or another method) when not doing graphics intensive tasks and just rely on the integrated graphics of the CPU? If you can, would that be an easy way to make a computer quieter since some graphics cards use as much power as a CPU (I'm assuming the graphics card's fan would also shut off)? I'm about to replace a 10-year-old Dell Dimension and want less noise (it was quite noisy, mainly the fans, even when new) as well as more speed. I'm going to stick with Windows for now (though I will probably buy a Mac Mini after its next upgrade to replace another old Dell--I've tried one and it's certainly quiet enough for me). I'm considering Dell's XPS 8700 (after all discounts, about $550 for one with an i7-4770, 8G of memory, and a 1T hard drive), which comes with either an AMD Radeon HD 7570 (standard) or an nVidea GeForce GTX 645 ($50 extra). Would I ever notice a performance difference if I'm not a gamer? I'm also considering skipping a discrete card altogether since the i7-4770 is supposed to have quite good integrated graphics. Also, I wonder which uses more power and therefore generates more heat, requiring more fan cooling. NVidea's site says the 645's max power usage is 130 watts, which is very high. I can't find the spec on AMD's site for the 7570 but another site says its max is 44 watts. If that's right, I'd guess the 8700 would be quieter with the AMD, unless the 645 has better power regulation when not at peak load. Post subject: Re: Turn off discrete graphics? Hi and welcome to SPCR. I can't speak to how quiet or loud the Dell XPS 8700 will be..so, let me focus on the other questions. The integrated graphics on the i7-4770 is good enough to do all your basic tasks as well as light gaming at lower resolutions. I wouldn't bother with either add-on graphics card listed. They are low end cards that really don't add any value. If you plan to game on the PC, then list the likely games and your monitor's resolution. You can't turn-off a discrete graphics card when using the integrated GPU. However, modern cards idle at ~10W. Also, that GTX card has a TDP of 65W. Thanks for the info. The 130 Watt number for the GTX 645 did seem high but that's what the manufacturer lists as "Maximum Graphics Card Power" at http://www.geforce.com/hardware/desktop ... ifications . Or is that a different spec from TDP? I'd be inclined to follow your advice and skip the separate graphics card entirely but the 8700 doesn't have an option to not include either the HD7570 or the GTX 645. I'm not planning to game so I think I'll just save the $50 upcharge for the GTX and stick with the stock Radeon. If it only uses ~ 10 watts most of the time it shouldn't affect fan speeds much, right? The 130W number still seems wonky as it's performance is just slightly above the 64W GTX 650 and well below the 110W GTX 650 Ti. Honestly, if you don't plan to game, go with the cheaper card. Yes, it'll only use ~10W in idle and low use...maybe 20W when playing BD disks. Should be fairly quiet..you can always use AMD's Catalyst Control Center to set the fan speed to a manual 30% or so. Or, consider removing it and just using the video output from the motherboard (I'm assuming Dell didn't go wacky and remove the motherboard video connectors...). There's really no difference in performance between the HD 7570 (which is a rebadged HD 6570) and your Haswell's integrated graphics. Thanks for the suggestions about the Catalyst Control Center and removing the card entirely. I think I'll eventually try removal (motherboard connectors permitting) to see how the integrated graphics do. I read somewhere that current computers will recognize the presence or absence of a discrete card and turn the integrated graphics off and on accordingly (and get drivers if necessary) so I won't even have to adjust any settings. I wonder if manufacturers like Dell install discrete cards even when the integrated graphics are just as good because people have been trained to think that discrete cards always give better performance--it's a marketing decision. This basically how Nvidia Optimus works, you can use Intel iGPU for all day working, and once an app that requires the use of the dedicated GPU it switches automatically (intel for nvidia), this is very transparent and with todays drivers it works very well, newer games you do have to add to the profile, or wait for new drivers so they are included. Sadly this hasnt reached desktops, and i kinda think it wont, in laptops its easier for manufacturers as they control all the hardware, firmware and bios, even their own designs of pcbs of mobos, cards, etc. So its easier for them to test and have a working finish product, while in desktops there are so many options in hardware that its impossible to control it. AMD also has their manual GPU switching, but all of this is also meant to save battery in laptops and not use a powerful GPU while not needing it. If you are not gaming or have use for the cuda cores, just use intels built in iGPU, it should be enough for almost anything the average user needs, even playing 1080p is easy for the built in gpu. The only reason to go for a dedicated GPU is if you plan on gaming or if you have apps like cad that can take the advantage of the cuda cores. 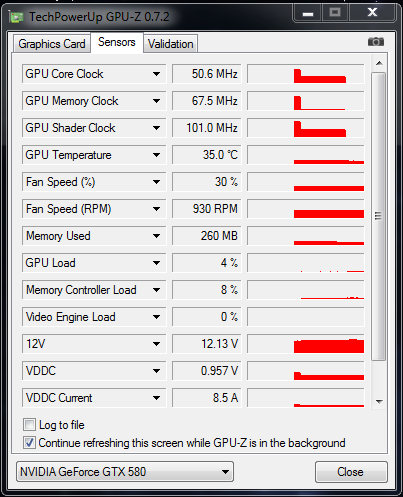 The idle results are brilliant, the fan will even turn itself off when the GPU idles. Btw dont get a dell, if you can built it, its not that hard and you can chose the components that will give you better performance and less noisy. Dell uses a lot of proprietary hardware that you cant easily replace, imo not worth it, unless you do value their support.